It’s been more than a decade since the Army adopted its first pixelated camo pattern—it was the start of the Iraq War, and the blocky digital pattern seemed to signal a new era of futuristic warfare. One problem: It didn’t work. At all. 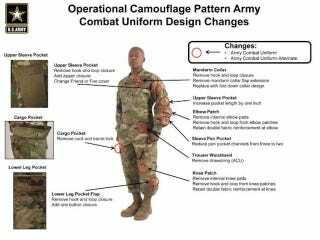 The fast realization that this pattern didn’t work led to something called the Camouflage Improvement Effort—a four-year-long design competition to find something better. In the end, the Army ended up not choosing any of its finalists, instead announcing it would adopt something called Operational Camouflage Pattern, or OCP, last year. This week, the Army announced that the official replacement pattern would be sold in stores across the country starting in July 1. The Army is finally, officially, putting its decades-long camo nightmare to rest. So why did it take so long? And why did they abandon four years of design work? Read on.